Advantages: Over 50 period photographs with additional colour close-ups from museum examples; 6 well-executed aircraft profiles; detailed 1:72 scale drawings; easy to read narrative. Conclusion: This is an all-new publication that carries updated information thanks to recently discovered material in Italy. The quality of the images and enlightening text will capture the readers’ interest and result in a better understanding of this classic tri-motor bomber. The Caproni Ca.3 had its first outing in the Datafile series nearly 12 years ago. It was authored by Gregory Alegi and now, more than 60 issues later, he’s back to take the reins again. This is the second of the two-volume study and follows the popular format of its predecessors. A lot of fresh information can be found within the 36 pages. We start with the soft card covers which are graced with the superb artwork of Ronny Bar. He contributes a total of 6 all-new colour profiles, 4 being of the Caproni Ca.3, one of the Ca.3mod and another of the Caproni CEP.2. Also found here is a full colour contemporary cutaway drawn of the original Fiat A.10 powered Caproni bomber. The author has chosen over 50 archive photographs to compliment the text. Most are printed two or three to a page which allows maximum detail to be gleaned from each image. They are all well captioned with the information contributing to the narrative rather than repeating it. Technical illustrations are also included and these show various parts of the airframe, engine, and cockpit equipment. Colour close-ups are a feature of this edition and these come courtesy of the excellent Caproni reproduction done by technicians in Slovakia. The Italian Air Force Museum also contributes some pictures which give the reader a better understanding of what’s under the fabric. Marty Digmayer shows off more of his competent handiwork by adding another 3 pages of scale drawings. These are the 1:72 scale versions that compliment the larger set found in Volume 1. 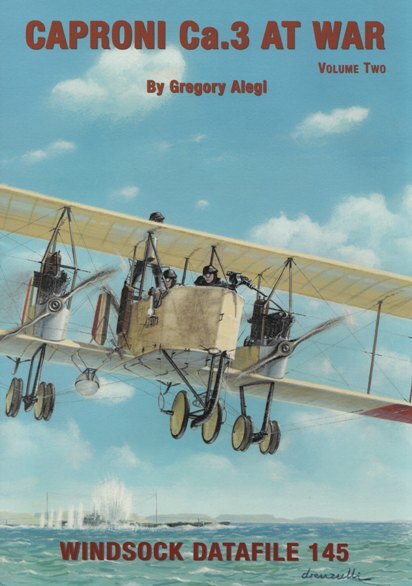 The author does an excellent job of taking the reader through the aircrafts’ operational history. The text is easy to read and includes sections on post-war use, designations, survivors, and modern copies. The appendices list aircraft of the Ca.3 family that were on the Italian civil register as well as deliveries by Caproni during the war years. The result is a fitting finale to the 2-part series on this iconic aircraft. With a lot of new material presented, it’s the ideal reference sources for both modellers and enthusiasts alike.